When you archive a Family from your main database into the Lead File, not all information is retained. The following information is retained when a family is archived and is viewable in the Lead File. These fields will be added back to a family's record if they are restored to your main database. Only the Billing Contact is retained in the Lead File. Any additional contacts will be included in the export that is done as part of the archiving process. They will need to be added back into the Family record manually if the family is restored to your main database. *Families sent to the Lead File on or after 11/11/2015. 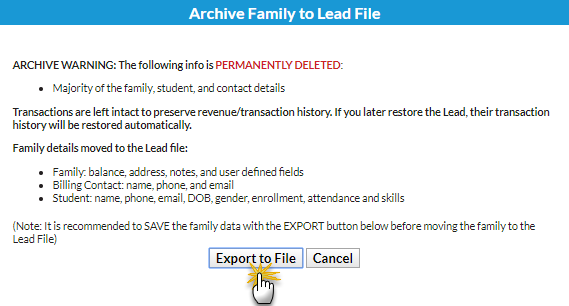 A Student's past enrollment data IS retained in the Lead File and will restore to the Family record*, however, historical enrollment reporting does NOT include Lead File families. While the Family is in the Lead File their enrollment history will NOT be included in any enrollment reports run in your main database. It is recommended you run any enrollment reports you need before sending Families to the Lead File. This information is all included in the export to Excel during the archiving process. It is a Jackrabbit Best Practice to run the export to Excel to ensure that you have a record of all of the family's information in the anticipation that they may return to your organization in the future. The following information is NOT viewable in the Lead File, however, it IS retained in the archiving process and will be added back to the family record if you restore them to the main database. If you need to see this information you can either refer to your Excel export or you can restore the family so that you are able to view this data. Optionally, you can then archive the family back to the Lead File. **Families sent to the Lead File on or after 4/5/2016. Transaction history is not visible within the Lead File, but a family's transactions are left intact in your database to preserve your revenue history/transaction history. An archived family's transactions ARE included in all financial reporting in your main database, even while the family is in the Lead File. When families are archived to the Lead File, the process involves (optionally) exporting the family data to Excel prior to the archive. It is highly recommended that you complete the Export to File step. In the workbook there is a sheet for each tab in the Family record. On each of the sheets, the columns display the information from all of the fields on that tab in the Family record.